Emsisoft is a website which provides you various decrypters for ransomwares, that are annoying as well as common to find. 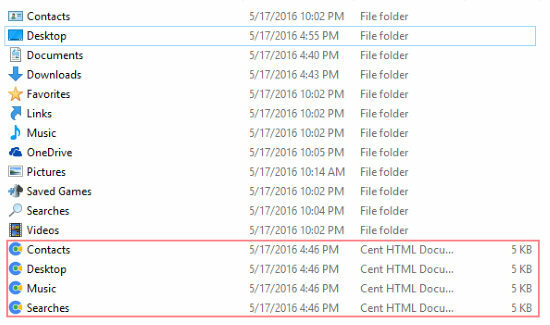 There are a total of 14 decrypters which attack 14 frequent ransomware and recover files encrypted by ransomware. The process is really easy and requires making minor settings in your Computer’s boot mode. You can also use a custom key to decrypt a ransomware encrypted file if the default doesn’t work. If nothing works, make sure you check out MalwareBytes’ Anti-Ransomware. Let’s take a better look at how Emsisoft works its magic. 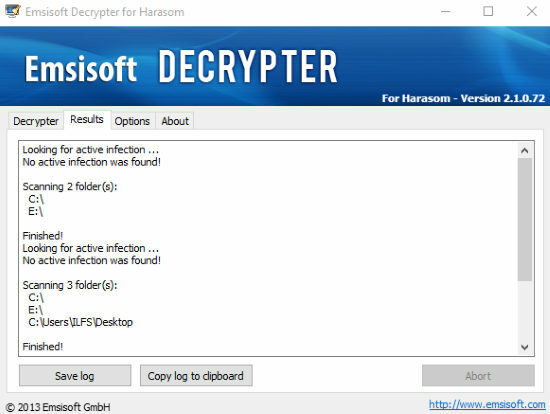 Emsisoft provides you decrypters for 14 different ransomwares along with a detailed usage guide and more technical information. 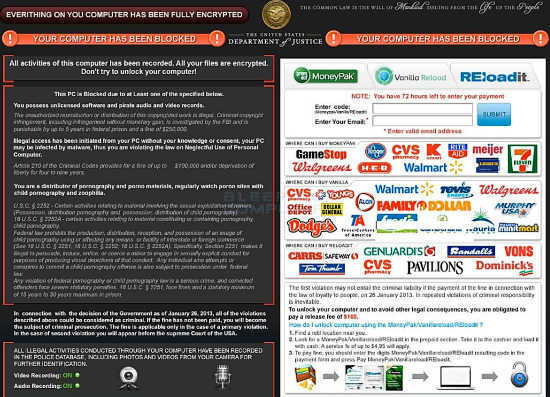 The technical information tells you about the Trojan responsible for inviting the ransomware. The detailed usage guide explains the modus operandi of the selected ransomware and the steps one can follow to remove that ransomware. So a ransomware called Harasom kidnapped my system and ‘threatened’ me of fake legal consequences if I don’t cough up 100$ and pay them with untraceable bitcoins. No problem! I downloaded the Emsisoft Decrypter for Harasom to fix this mess. But before we run the decrypter, make sure to boot the computer in Safe Mode with Networking. For those who don’t know how to boot in safe mode, keep pressing F8 till you get the Boot Advanced Menu Option. Login the user account where the files have been encrypted. Run the Emsisoft Decrypter. There are 4 different tabs on the Decrypter’s interface namely Decrypter, Results, Options and About. Right now, we are concerned with the Decrypter tab where we have to choose the volumes and folders that we want to scan. Click the Decrypter tab and select all your Disk partitions to make sure none of the encrypted files are left behind. 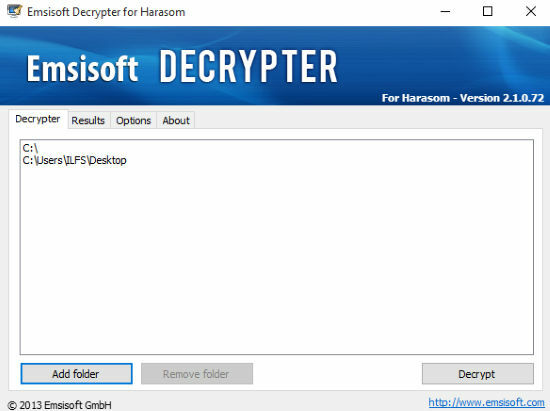 Emsisoft Decrypter will run the scanner in the Result tab and decrypt all the ransomware encrypted files. Consequently you have to run an antivirus to remove the malware program that brought the ransomware in your system. You can save the scan log as well. In the Options tab of the Decrypter, you can choose to delete the encrypted files after successful decryption. In cases where you know the decryption key to the encryption done by a ransomware, you can select ‘Use a custom decryption key…’ and paste the decryption key in the space provided. I am really glad that Emsisoft has provided awesome tools to distressed people who have lost important files to annoying ransomware. Normally a ransomware infection ends up with the Computer being formatted. Now, you don’t have to take that big step and recover all your important files effectively. I give Emsisoft 5 stars for its service.